In Hangman Puzzle you have been provided with a clue. You have to guess the answer using the dictionary letters provided. You only have a certain number of wrong guesses before the game is over. Each correct guess will reward you with letters displayed in the sentence and with more free guess until you have solved the puzzle or used up your failed attempts. You can save your puzzle progress and return to this at a later date. In the English language, the 12 most commonly occurring letters are, in descending order: e-t-a-o-i-n-s-h-r-d-l-u. This and other letter-frequency lists are used by the guessing player to increase the odds when it is their turn to guess. On the other hand, the same lists can be used by the puzzle setter to stump their opponent by choosing a word which deliberately avoids common letters (e.g. rhythm) or one that contains rare letters (e.g. jazz). Another common strategy is to guess vowels first, as English only has five vowels (a, e, i, o and u), and almost every word has at least one. 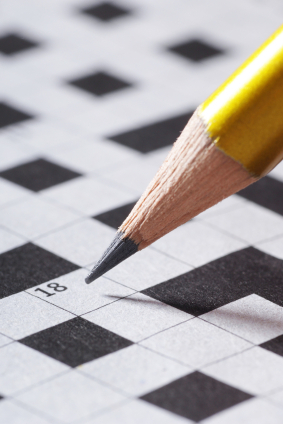 i want a crossword puzzle.